A few years spent baking already and I still don’t have a KitchenAid! Mrs Seddy always makes fun of me because I take ages to whip the cream or to whisk the eggs and the sugar! The thing is I am still not sure if I want to be a cook or …a PASTRY chef! (Does it sound like I am serious?!). The main difference being if you decide to go for Bimby/Thermomix or for KitchenAid!Yes. KitchenAid is much more glamour and it comes in nice fashionable colours whereas the Bimby is more about functionality and pragmatism, but it’s not only that. (Even if that bright red KitchenAid is SO cool!!). When I ask what’s the difference between the two, everybody goes like ‘with the Bimby you can also prepare soup and mash potatoes!’.. do I really want to end up preparing soup and mash potatoes, with a 900gbp food mixer!? Everything got simpler when I got in touch with Mrs Faby of www.personalcake.wordpress.com, she can cook and bake everything! She’s got both of them – of course! – and basically she explained me that the Bimby is more about cooking something when you are dealing with seven thousands other tasks and KitchenAid is more about enjoying the baking-aspect of your life and feeling glamour at the same time! So, I am more a KitchenAid person indeed. Now I only need to make sure that my husband doesn’t think to give me this as gift for my birthday… instead of that super nice Celine bag. 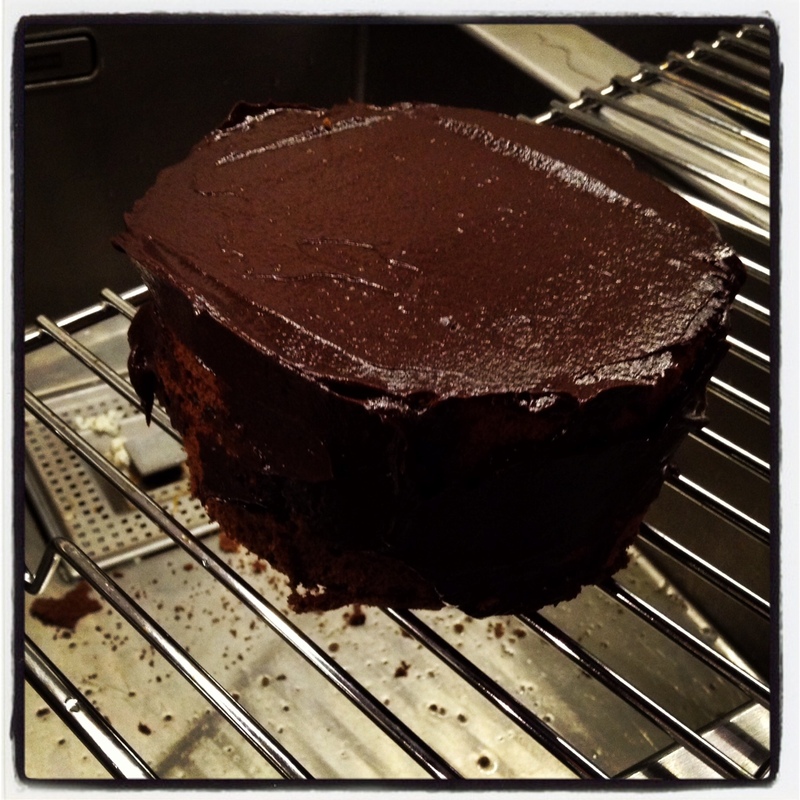 Anyhow, I baked this chocolate cake with my minipimer hand-blender! Turn the oven on at 205°. Prepare the base for the tin. Place the tin on top of the greaseproof paper and cut out a disc to line the base. Place the greaseproof paper disc inside the tin. Butter the mold and coat it in flour, then tap off any excess and reserve the mold in the refrigerator. Take off the heat and keep whisking until quite proud and fluffy. Sieve the flour and fold it in with a spatula. Then transfer the batter into the prepared mold and bake it. Once you close the oven, reduce the heat to 185° and bake it for 20 minutes. Try with a knife-in-out to see when it is ready. Remove the sponge from the mold, once ready and leave it to cool down for a couple of minutes. Turn the cake upside down and put the mold on top of it to press it down and make it even. In a small saucepan, combine the sugar and the orange juice. Over low heat, bring it to boil until the sugar is totally dissolved. Remove from heat and set it aside to cool down and then add the liqueur. Place the cream in a saucepan and bring it to a simmer. Place the chocolate in a bowl and pour over it the hot cream. Stir until the chocolate is totally melted. Add the glucose and allow the ganache to set until it has a butter-like consistency. Once the sponge has cooled down, turn the cake up again and trim the top flat with a serrated knife. Now, work with the sponge upside down again, to have to top side as even as possible. Slice the sponge around until you have two even layers and put the top aside. With a pastry brush wet the entire surface of the bottom layer with syrup to imbibe it. Then place a large spoonful of orange jam on the bottom layer and spread it out to the edges using a spatula. Place the second layer on top of the bottom layer and press it down lightly. Smooth away any overflows of jam. Now it’s time to coat the cake. Using the chocolate ganache, cover the top and the sides of the cake and then place the cake on a wire rack. Warm the remaining ganache to a thick pouring consistency and pour the warmed ganache over the top of the cake ensuring the sides are evenly covered. Then use the remaining ganache to pipe some shells.